THIS POST MAY CONTAIN AFFILIATE LINKS, PLEASE READ MY DISCLOSURE FOR MORE INFO. Everyone loves a good gift basket, but truth be told they can get pretty pricey. 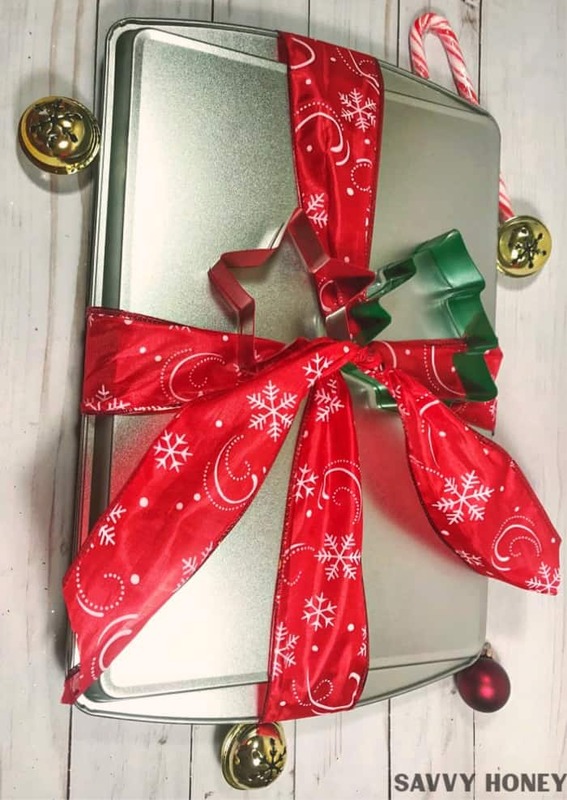 That’s why I wanted to share with you guys these cheap Christmas gift baskets I whipped up in the hopes that you can save some money this holiday season! Now all the contents, baskets, and decorating essentials were all purchased at the Dollar Store…Dollar Tree to be exact. The key to these cheap Christmas gifts are to tailor each basket to the taste of the receiver. Think about their favorite colors, scents, foods, hobbies, etc. Those are the best gifts of all when people try to buy for you, not necessarily with their tastes in mind. You really hit a gift out of the park when you take note of the little things the recipient loves. 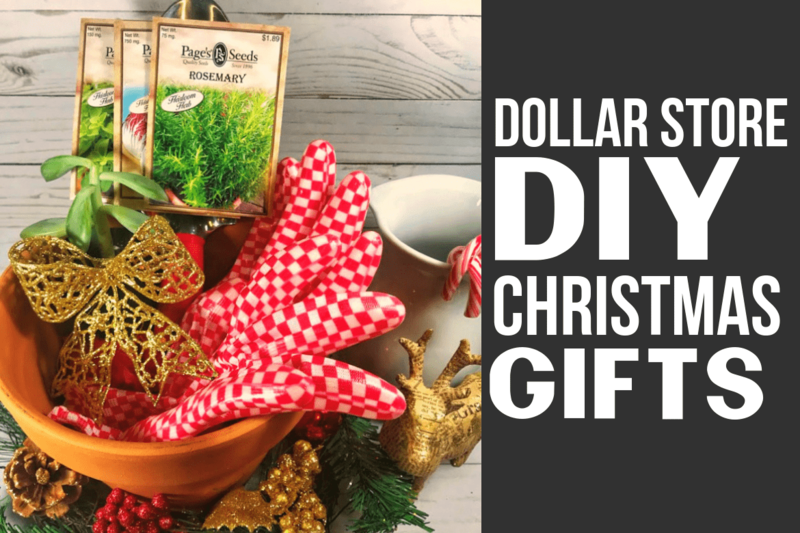 These cheap Christmas gift ideas from the Dollar Store are perfect for just about anyone on your list. 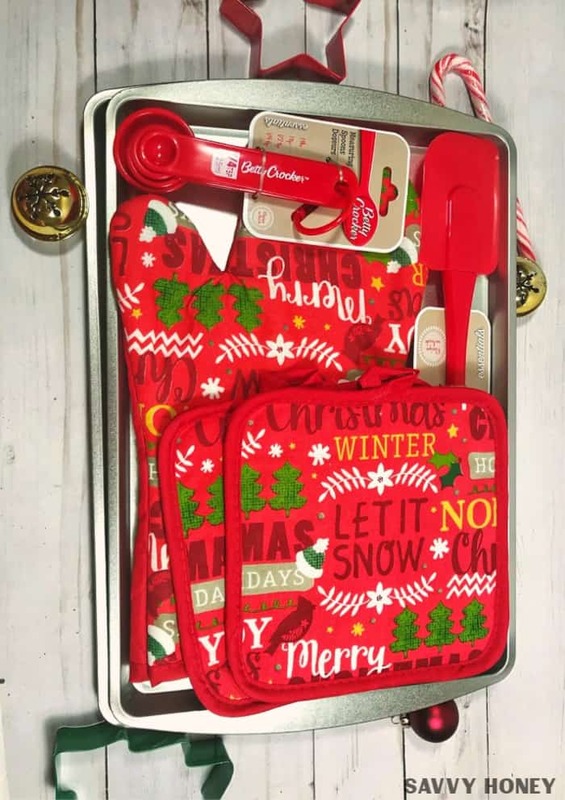 If you have someone on your list who loves to be cozy during the holidays, has a car, gardens, bakes or enjoys a little pampering, then you’ll be all set! These Christmas gift baskets are not only super cute and easy to assemble, but they are all under $10!! 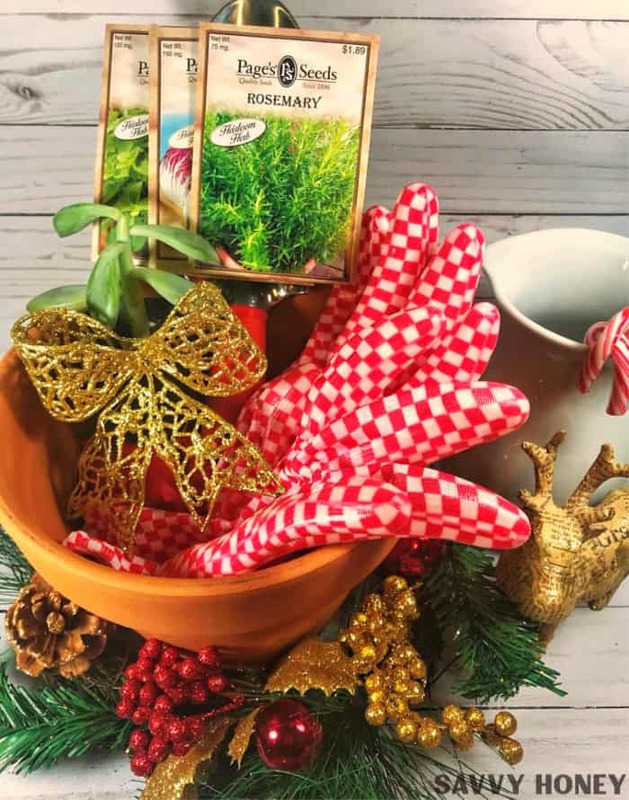 Take a look at these Christmas gift baskets from the Dollar Tree below and let me know which ones you’re planning on giving this year! Hope you have a wonderful Christmas!! This little wire basket is from the Dollar Tree of course. I tied some bells on it, and placed a bell inside as well for decoration. I put some beaded garland in the bottom of the basket for a little sparkle, but you could also just line the bottom with tissue paper. To dress up this plain terracotta pot, I placed it in this little wreath I found at the Dollar Store. You don’t have to do this, I just thought it made it a little more holiday like. You could also paint the pot or tie a festive ribbon around it. You may have noticed there is no car washing soap in this basket lol. For some reason my Dollar Tree was out, but don’t forget to include this! To make this wire basket more festive I wrapped a gold piece of ribbon around it and taped it in the back. I tied some bells on the side and added one on top of the bath bomb. Oh and I had some silver glitter ribbon which I wrapped around the top of the bath salts for a little sparkle. While this may not be a basket, it’s close enough in my book. I decided I needed a clever way to wrap these baking goodies. I used the two cookie sheets as my “box”. Place a cookie sheet upside down on top of your cookie sheet filled with all the contents. You want to make sure everything is pretty flat and nothing sticks up too much or your cookie sheets won’t fit together. Then I finished it off by securing everything with a ribbon and tying a couple cookie cutters on the top. Cute, right? You could also give this gift with some cookie mix or baking ingredients as well. 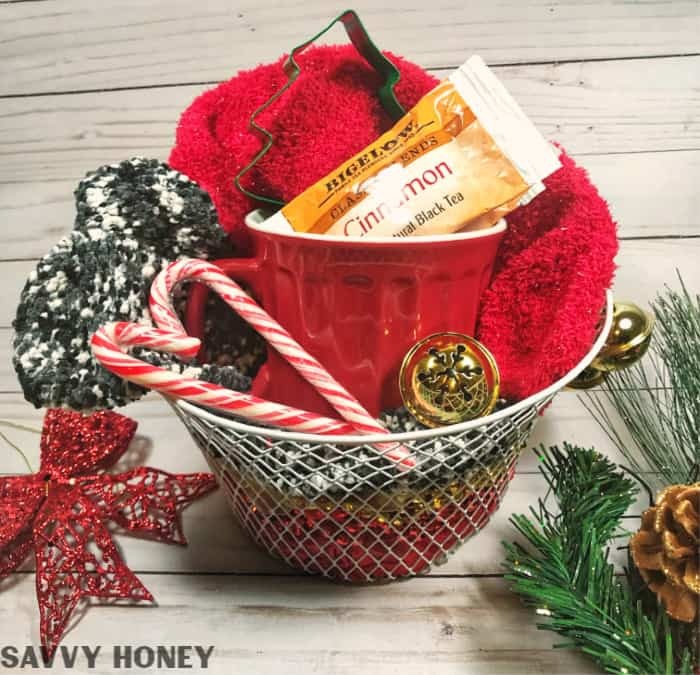 Save this Christmas basket post for later on Pinterest here!! 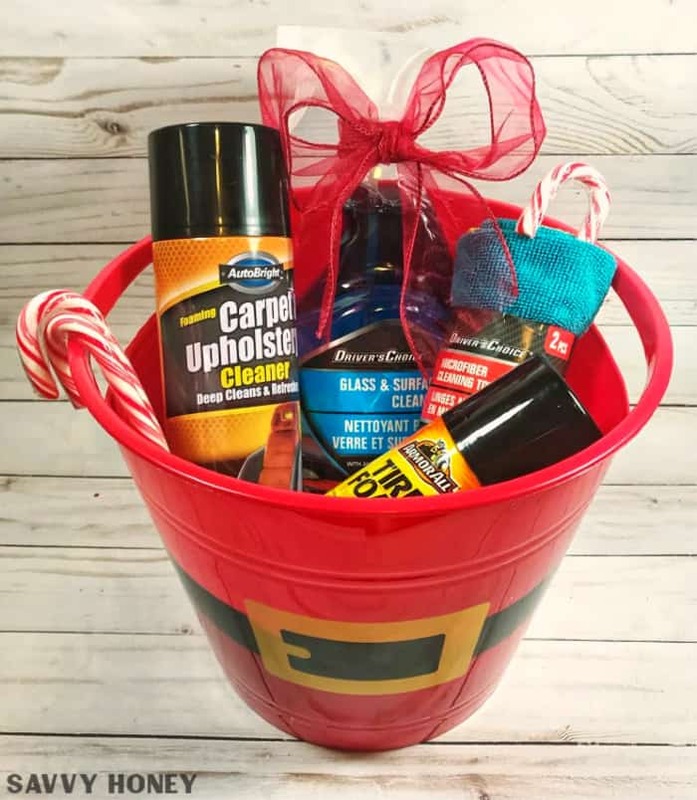 cheap Gift baskets from the Dollar Store! Hi there, I'm Annie - creator of Savvy Honey. I'm here to help you live easier by offering savvy ideas, tips & inspiration in all areas of life! Copyright © Savvy Honey. All Rights Reserved. 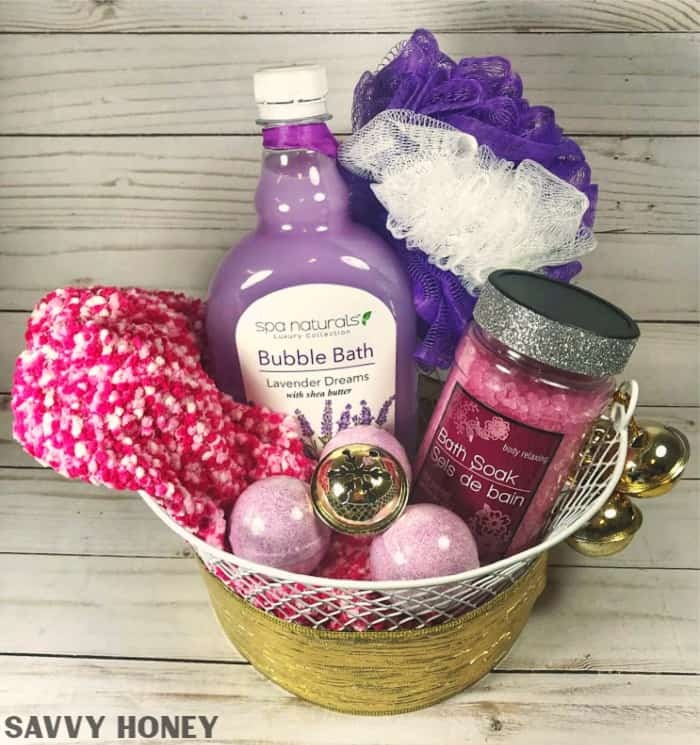 Savvy Honey is a participant in the Amazon Services LLC Associates Program, an affiliate advertising program designed to provide a means for us to earn fees by linking to Amazon.com and affiliated sites.